This spectacular 4.02 carat unheated Tanzanite Asscher Cut, is a one of a kind, collection quality gem. 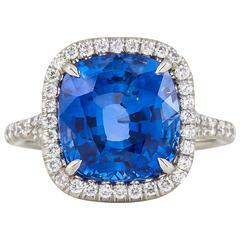 Unheated Tanzanites displaying this type of hue, clarity and cut, are very scarce and represent the finest of their kind globally. Merkaba Jewelry offers this desirable gem to the world's most avid gem collectors. This Tanzanite would make a very attractive bespoke jewelry piece. Specifications: Natural Unheated Tanzanite - 4.02 carats, Asscher Cut AGL Certificate attached ***Returns are accepted within 7 days of delivery and will gladly be paid by us.